Functional Vision - Learning Insights, Inc. 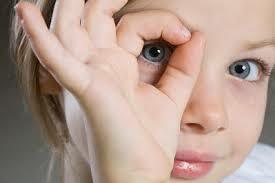 Humans must learn to use their eyes just like they learn to use fingers, toes, and other parts of their bodies. Functional vision is the set of skills we learn to track smoothly, change focus from target to target, adequately perceive what we're looking at and maintain visual focus. The most complex system in the human body is the vision system. Many networks in our eyes and brain must function properly so we can make sense of the images we see and use the information we gather to respond. While eyesight is the ability to see an object clearly, vision is the ability to understand and apply information that comes through the eyes. According to the American Optometric Association (AOA), about ten million children under the age of twelve in the United States have vision problems that make it hard for them to cope with the expectations at home and school. The V.I.P. program has found that 35% of screened students have vision issues; with a full 15% suffering from significant challenges. Research conducted over the past 40 years and V.I.P. data support that vision challenges directly impact reading skills.